In the time that I have owned my Honda CB125E I have had cause to use it under a variety of circumstances from heavy inner city traffic in Sydney to rolling through the scenery riding it down the South Coast. Of course the Royal National Park, the Mecca of Sydney motorcyclists is only a few kilometres from where I live and I have done a few laps through it as well much to the amusement of fellow riders on much more appropriate machines. Let me summarise how it performs under the three main types of riding we are likely to encounter, the inner city commute, the outer suburban commute and the open road. Lets start with the inner city commute because this is where I can only say good things about the Honda CB125. If you live and work in a densely populated urban environment or even just need cheap transport fom home to the nearest train station this is the motorcycle you should put on the top of your list. On one of my recent forays into the inner city of Sydney I noticed that as soon as I got to around Tempe (approaching from the south), traditional scooter territory had given ground to the small Honda and I encountered over a dozen CB125's by the time I had travelled up the Princes Highway, turned up Cleveland Street and made my way to Mascot via Botany Road. Of course there were many Vespas, Piaggio's and Honda NV50's to be seen partucularly around Newtown but for a bike that has only been available for such a short period of time the CB125 has certainly achieved good penetration amongst the inner city market. There was a fair cross section amongst the riders too with young, old, male and female pilots to be found. Learner riders, provisional riders and full licenced riders alike seem to be buzzing around on these little urban machines quite happily. This is where the Honda CB125 is really at home. With speed limits generally no higher than 70km/h and most commonly either 50km/h or 60km/h the Honda shows how nimble it can be out accelerating many scooters and holding its place amongst four wheeled traffic. Sitting in heavy traffic the air cooled engine burbles away happily and it handles the extended stop/go situations that plague the inner city with no sign of overheating. Fuel economy in this environment is nothing short of excellent. Filtering between the cars is a piece of cake as the bike is quite narrow and light making it easy to wind around obstacles. 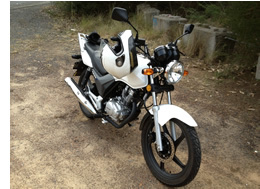 The Honda CB125E performs well in the outer suburbs as well. With speed limits generally 70km/h on major roads and suburban streets mostly limited to 50km/h the CB125 will be well within its capabilities and will provide reliable transport around town with good fuel economy. It will cope well in the occasional 80km/h zone that you might encounter but becomes stretched above that, on level ground it will accelerate to 90km/h and beyond however unless you are feather light any reasonable grade will reduce your speed back down to 80km/h. I would presume that at 80km/h the engine is making peak torque and beyond that torque drops off rapidly. Steep hills will have you back shifting to fourth gear pretty quickly and even third gear on longer steep climbs. One part of my personal commute from Sutherland area to St Marys can be used as an example of the Honda CB125 reaching its outer limits. The Heathcote Road is 100km/h and is slightly downhill heading towards Liverpool. The little Honda will sit on 90-95km/h at half throttle with no problems on the way there. More than fast enough for a provisional licence holder. The return journey on the Heathcote Road is somewhat different because it is slightly uphill. At wide open throttle the bike will reach 80km/h and then struggle to climb higher than that, reaching 90 on the level ground and being knocked back to 80km/h on the grades. I can imagine that the people in the cars behind me just love doing 80km/h in a 100 zone. Fuel economy suffers when the little Honda is held at wide open throttle but this can only be expected I guess. It gives no signs of overheating during this protracted climb. The rest of my journey is mostly 70km/h and 80km/h zones and the bike is a comfortable ride regardless of direction travelled. Many people find it quite funny that I have ridden my Honda CB125E to the south coast and often ride it through the Royal National Park. Of course, if your not a Sydney resident these place names have no meaning to you. Sydney to Wollongong is a reasonable ride of about 60km (at a guess) between our state capital and its nearest neighbouring regional city. The national park I speak of is nothing short of massive at about 154 square kilometres and found at the southern end of Sydney. Now the Royal National Park is a scenic and relaxing place to ride that is a popular destination for Sydney's motorcycling community, possibly because of the opportunity to get closer to nature and enjoy the great outdoors but more likely because of the long winding roads with 25km/h corners and plentiful opportunities to scrape the footpegs on the ground. The legal speed limit in the park is 80km/h and the Honda CB125E does surprisingly well as a result. Many of the uphill grades in the park are windy with signposted 25km/h and 35km/h corners. Powering through these at 60km/h on the CB125 is very possible and surprisingly fun. It would be more fun on a CBR600RR of course but hey, you've got to enjoy the machine you've got. On the open road the honda CB125E is well and truly out of its element. I will state this bluntly so there are no misconceptions. It doesnt mean you cant jump onto your toy Honda and take a day trip out of the city but you must be aware of the limitations of this motorcycle and plan your trip accordingly. Be aware that this motorcycle will cruise at 80km/h comfortably but above that is something of a challenge to maintain for heavier riders so your speed will go up and down in line with the terrain. You will be running the bike at wide throttle positions at the upper end of its operating range so it will not give the same fuel economy you would enjoy in the city. Budget for heavier fuel consumption and plan your fuel stops accordingly. This holds true for any journey out of an urban environment on this motorcycle, be patient, resist the temptation to thrash the bike and the Honda CB125E will get you there, no problems. Before buying your Honda CB125 consider your intended use of the bike. Are you commuting to work, university or school? Running out to the shops for milk, scooting around town or just riding to your friends place? What are the speed limits of the roads you are going to ride regularly? Throughout this website you will have noticed that 80km/h is a magic number that pops up a lot. This is the highest speed that the Honda CB125E seems happy travelling and is something that needs to be taken into account when deciding if this is the right bike for you. Although I might complain that my commute has about 8km's of open road where the bike does not perform as well as I like (and only in one direction you may have gathered) the other 100 or so kilometres I travel on a work day the CB takes in its stride and is a pleasure to ride. All in all my commute is within the bikes capability. If you intend to only ride on the open road then the CB125E is probably not the right choice especially if you are in a hurry. As an urban commuter motorcyle the CB125 is hard to beat but its uses become liimited beyond that. It is an excellent choice for learner riders.